Clear strategic vision on your short term and long term goals. Access to an exclusive network of experts for all your business needs. Receive free marketing corporate presentation of 10 slides that present your company. Benefit from 1 hour of consulting per quarter with our senior consultants. Get more live visibility on your business & goals with quarterly updates: financial projections, industry & competition. Receive 50% off our members only service for marketing documents, editing/proofreading services, translation, business plans, presentations and proposals, all your documents handled in one place. 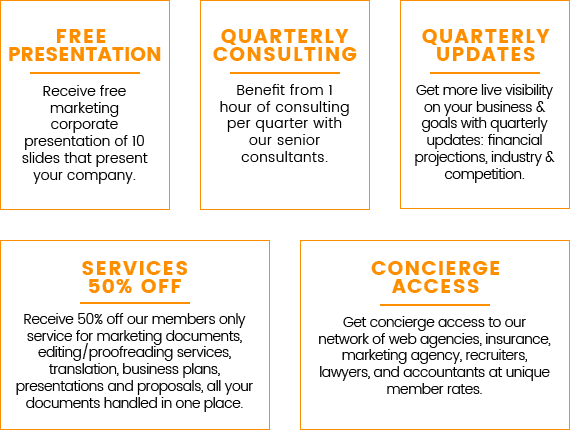 Get concierge access to our network of web agencies, insurance, marketing agency, recruiters, lawyers, and accountants at unique member rates.